It’s fashionable in the theatre sector to consider theatre buildings as a necessary or maybe even an unnecessary evil. At theatre conferences there are often voices saying, ‘Tear down the buildings, we don’t need them’. I joined the Theatres Trust as Director in January and, last year, when I announced my departure from the Federation of Scottish Theatre to take up my new post, one prominent FST member asked me, “But why Jon? It’s buildings!” I should add, that individual is a senior manager at one of the major theatre buildings in Scotland! For me it’s not buildings, it’s people. It’s the way theatre buildings at their best incubate and facilitate the work of artists and connect that work to communities who feel a sense of ownership and belonging over the theatre and what goes on inside it. At the Theatres Trust we want to ensure that there are excellent, well designed and well managed theatres across the UK where communities can enjoy the inspiration and excitement of live performance. That means working both with communities trying to save their local theatre and with current theatre operators, on all scales and across the spectrum of commercial, charitable and community management, who need to develop and adapt their building or who are looking to build a new theatre from scratch. Since I started I have met and discussed our work with theatre operators, theatre-makers, consultants, architects, developers, community groups and local authorities. We work with a diverse range of passionate supporters for theatre buildings and the common thread in our conversations has been not just the bricks and mortar, but more importantly what they mean for the people and the places where they are situated. 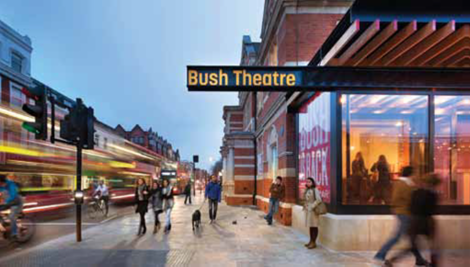 I recently attended an evening to celebrate the re-opening of the Bush Theatre in London following a major redevelopment project. At the event, which brought together the Bush’s diverse communities of artists and audiences, Artistic Director, Madani Younis, recalled the closure of the building for the redevelopment work when he had blithely said, ‘We can make theatre anywhere’. But upon returning to the re-opened building he realised the importance of it as a point of confluence, a place where the local community could tell and hear their stories, a statement of and a focus for both the Bush’s values as an organisation and the hopes and aspirations of the community it serves. In this sense theatres are more than just places where we can create and experience exciting live performance, they are part of what makes a community, it’s identity, it’s vibrancy and the quality of life for all who live, work or visit. This is sometimes known as placemaking. Culture Secretary, Karen Bradley, has said, “Places aren’t simply somewhere to build a factory. To have heart and soul, they need galleries, theatres, music centres, cherished heritage sites, libraries, museums and sports facilities.” And for that reason all of us who work in the theatre sector should care about theatre buildings, whether or not we manage or work in one. The challenge is to make sure that theatres, old and new, adapt and change to reflect the changing needs and ambitions of artists and communities. This means taking bold decisions as they have at York Theatre Royal to adapt their Georgian theatre to meet modern standards and expectations in both design and audience/community use. And it’s not just about architecture, it’s about ethos. We need to remember that theatres are a valuable resource that should be shared. Whilst there are many excellent examples of good practice, we should encourage more theatres to open up to a diverse range of artists, involving those artists and the local community in shaping the work of the theatre. So, there’s lots we need to do at Theatres Trust and across the wider theatre sector to make sure we preserve, develop and build inspiring theatres that meet the needs of artists and communities across the UK and make our towns and cities great places to live. If you would like our advice or support or to help us with our work, do please check our website or contact us and if you want to join the debate, come along to our conference on Theatres and Placemaking on 17th October at the Lyric Hammersmith – use ITCNEWS discount code when booking. The Theatres Trust is the national advisory public body for theatres. We champion the future of live performance, by protecting and supporting excellent theatres which meet the needs of their communities. We do this through providing advice on design, planning and development, supplying resources and advice to make theatres sustainable and offering financial assistance through grants. We help people discover more about theatres and campaign for theatres at risk. There are more different option and method to open documents windows 10,now following this way step by step find my documents windows 10 if you want to get more related info so just click here this site. I enjoyed reading your thoughts on the significance of theatres. I used to live in Atlanta, where they have really terrible traffic, but also really great, charming theatres, and I miss being able to visit them regularly. Keep fighting the good fight to keep theatres relevant in our technology-obsessed society.